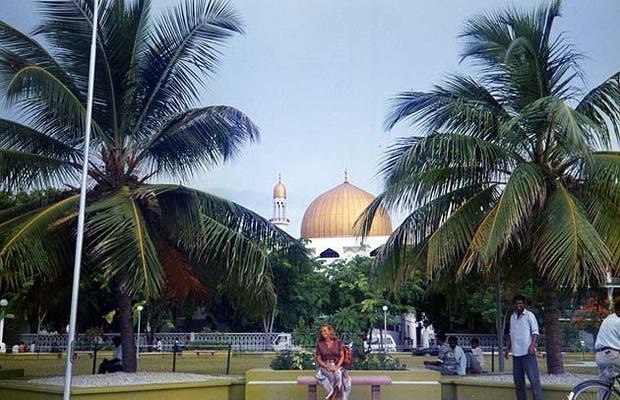 In the heart of the capital of the Maldives, Malé, stands the oldest Mosque of the islands called Hukuru Miski Mosque, its dome is visible from any place on the island. Although tourists are not allowed inside, they can see the outside and go up the marble stairs to see the inscriptions on its front door. Close to the Mosque is the cemetery and the Bazaar Singapore where visitors can buy souvenirs and other things. This mosque is famous for its intricate stone carvings. Islam is represented here through a large fully carved panel, dating back to the 13th century. On the outside you can see many tombs, among which is that of Abdul Barakat Barbari and others belonging to sultans.